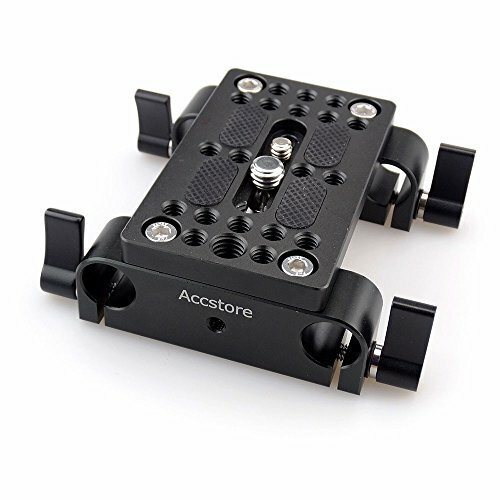 ACCSTORE Mounting plate with 15mm rod clamps for directly mounting to the camera and cage, which provides protective and stable mounting options to camera devices. The camera could be slid and adjusted along the middle groove, allows 40mm adjustment for balance controland, accessories can be mounted via the 1/4'' screw and 3/8'' screw. The mounting plate has four rubber pads for protecting your camera from being scratched. It could be used for directly installation of cameras, cages and tripods etc. The 15mm rod clamps feature standard 15mm rod holes, 60mm apart centre to centre. Compatible with all 15mm rods. It provides 1/4"-20 thread holes and M5 thread hole and 3/8''-16 thread hole, adjustable ratchet knobs can be easily installed or released the rods conveniently. It is mounted on a 15mm rail for attachment mounting and can carry long lenses and front heavy duty camera packs such as focus, matte box, lens support, etc. Made of light weight aluminum alloy, precision CNC machined, easy to use, practical and aesthetic. If you have any questions about this product by ACCSTORE, contact us by completing and submitting the form below. If you are looking for a specif part number, please include it with your message.